Apricot trees grow to manageable heights of 15 to 20 feet, are attractive and have bright fall color. The fruit is a summertime treat, but gardeners often resign themselves to late, bloom-killing frosts that destroy any hope of an apricot crop. However, apricots don't have to be an occasional bonus; plant a late-flowering cultivar and enjoy the fruits of your labor. Also called 'Mormon' apricot, 'Chinese' apricot trees bloom late and ripen early, often in early July. The medium-sized fruit has a good flavor and ripens to a yellow or light orange. It is self-fertile, produces a large crop and pollinates other apricots. 'Tilton' has small fruit with big flavor. This April-blooming apricot is also frost-resistant; frost is less likely to damage the blossoms. The yellow fruit is blushed with red and is equally flavorful whether canned, dried or eaten fresh. 'Tilton' bears heavily, ripens in early July and is self-fertile. 'Perfection' has large fruit that ripen in July. According to the Utah State University Extension, both the skin and the interior of the fruit have a rich, golden orange color. The fruit are firm, do not bruise easily and have an average to good flavor. 'Perfection' is a late-blooming apricot tree with a low winter chill requirement. It does, however, require a pollinator. 'Sungold' apricots are larger than most other varieties and ripen in late July. The bright orange fruit can be plum-sized, states the “Sunset Western Garden Book,” and has a mild but sweet flavor. 'Sungold' blooms in late April and requires another variety, such as the 'Moongold' apricot, as a pollinator. 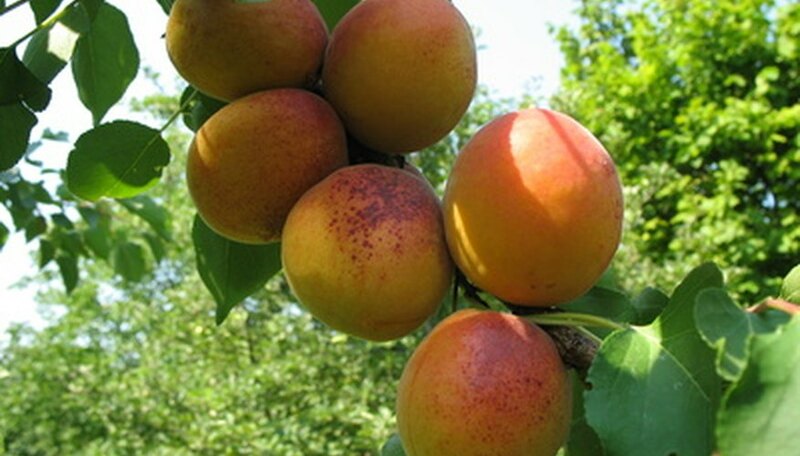 The 'Scout' apricot is an introduction from the cold latitudes of Canada, according to North Dakota State University. This apricot blooms in early May, when the danger of a late frost is considerably lower. It is self-fertile. However, 'Scout' produces a heavier crop when a second variety is planted as a pollinator. The fruit ripens in late summer, often into August, and the medium-sized fruit is equally flavorful eaten fresh or canned.